Let Knapp I.T. 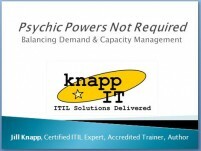 be your ITIL Expert. We offer a wide range of hands-on consulting services. How mature are your processes? Are people actually using them, or are your processes sitting on a shelf in a binder, largely ignored? Organizations greatly benefit from maturity assessments to gauge ITIL® readiness and adherence to various IT compliance demands. Need an objective set of eyes? Applying the principles of CMMI and the IPW Model, we assess your IT organization’s processes in three phases: Planning, Measuring, and Reporting. During the Planning phase, objectives, activities and participants are established and documented; the scope is defined. The Measuring phase collects data on the organization’s processes and maturity analyzed and assessed. The Reporting phase wraps up the exercise, and the results are documented and presented to key stakeholders. From this point, you may choose to champion the process improvements on your own, or you may choose to partner with an external consultant (hint hint) to ensure the project keeps momentum. If your organization has chosen ITIL® for its IT Service Management approach, you’ll need to know where to start. Do you begin with Service Level Management, or with the Service Desk? And what about all of those pesky Problems that could be remediated once and for all with Problem Management? Knapp I.T. can provide a customized roadmap for your organization. After an assessment of your process maturity and current IT Service Management challenges, a report outlining your organization’s best path to success will be compiled and presented. From that point, you may choose to champion the ITIL implementation on your own, or you may choose to partner with us to ensure the project keeps momentum. In rapidly-growing environments, processes become outdated shortly after their implementation. Or worse, processes never get documented in the first place, and new hires are thrown into the fire and forced to invent their own way of doing things. When nobody has time to correct the newbies’ methods, their invented tactics get passed down to the next round of new hires, and eventually you have a tangled web of inherited bad habits backed only by good intentions. Is your organization responding to an RFP? With over a decade of hand-on experience in contract management, engagement management, and technical account management, we know what questions to ask and what pitfalls to be aware of when reviewing RFPs. It’s one thing to respond to an RFP and negotiate a contract; it’s another thing to be the person on the ground serving living by that contract as they serve the client. Knapp I.T. can help ensure that the contract language sets you up for success. We all hand out course evaluations at the end of class asking students how they liked the class. But what do we actually do with those evaluations? Are they asking the right questions? Do you have the time to watch your instructors in action to determine their effectiveness, and if so, do you have the skills to evaluate them? Let us help. Jill Knapp, President of Knapp IT, has been providing independent Instructor Evaluations and Train the Trainer programs since 2007. She holds a degree in Education from one of the best teaching universities in the US, and comes from a long line of educators, plus she taught in a public school (K-12) and is currently an adjunct professor at Villanova University specializing in IT Service Management and ITIL. For more information, email Jill directly at jill att knapp-it dott comm.